Eric F. Wood is a hydrologist at Princeton University, well-known for his work in hydrology, climate, and meteorology. He worked as a research scholar in IIASA’s Water program from 1974 to 1976. 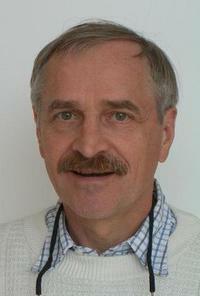 On 30 April, 2014, he received the European Geophysical Union’s Alfred Wegener Medal in Vienna, Austria. IIASA: How did you get interested in hydrology? What drew you to the field? EW: I came to IIASA after I finished my doctorate at MIT. I worked in the areas of system analysis and statistics related to water resources. During my first sabbatical leave at the Institute of Hydrology in the UK (now the Center for Hydrology and Ecology), I started to collaborate with Keith Beven on hydrological modeling, which started my transition towards the physical side of the water cycle from the policy and systems analysis side. A few years later, Robert Gurney, then at NASA and now at the University of Reading (UK), asked if I would be on the Science Advisory Committee for NASA’s Earth Observing System (EOS), which was just starting to be planned. This started my research activities in terrestrial remote sensing. Over the next 25 years these elements have played heavily in my research activities. What have been the biggest changes in hydrology and earth science over your career – either in terms of new understandings, or in how the science is done? I can name three huge changes, all inter-connected: One is the increase in computational resources. High performance computing—petabyte computing using 500,000+ cores—is now available that allows us to simulate the terrestrial water and energy budgets using physics resolving land surface models at 100m to 1km resolutions over continental scales, and soon at global scales. The second big change is the availability of remotely sensed observations. There are satellite missions that have lasted far beyond their planned lifetimes, such as the NASA EOS Terra mission, where we now have over 15 years of consistent observations. These observations have been reprocessed as algorithms have improved so we can now use the information to understand environmental change at regional to global scales. The third major shift has been computer storage. Large amounts are available at low prices. We have about 500 Terabytes of RAID storage, and can acquire 150TB for about $10,000 or less. This allows us to store model simulations, remote sensing data, and do analyses that were once impossible. Together, these three changes have transformed my field, and the field of climate change related to terrestrial hydrology. Going forward, we have the data, the projections and analytical tools to look at water security in the 21st Century under environmental change. What insights has remote sensing brought to hydrology? Remote sensing offers a global consistency that is unavailable with in-situ observations, and offers observations over regions without ground data. This permits us to analyze hydrologic events such as droughts within a global context, and relate these hydrologic events to other drivers like ENSO (tropical Pacific sea surface temperature anomalies) that affect weather and seasonal climate patterns. What do you see as the key questions currently facing water resources? The biggest question I see over the next decades is how water security will be affected by environmental change. By environmental change I mean climate change, global urbanization, increasing demand for food, land use and land cover change, pollution, etc. Water security is coupled to food and energy security, and water security is and it is intrinsically linked to the climate system and how that may be changing. How did IIASA influence your research interests or career? I made many friendships during my stay at IIASA and I was exposed to world-class research and researchers. This helped me in thinking about important research questions and the types of problems and research that will have impact. What do you think is the role for IIASA in the worldwide research community? There are many answers to this question. IIASA plays an important role in providing critical scientific information and analyses related to global issues that go beyond countries – transboundary analyses, and therefore that can provide the scientific basis for global policies. There is an urgent need for more global policies on environmental change and adaptation, food and water security, and environmental refugees, to name just a couple examples in my area. IIASA has also developed scientific methods and data that can be applied by various groups. For example, IIASA’s world renowned integrated assessment models have been used in climate change modeling for the IPCC and Coupled Model intercomparison Project (CMIP).